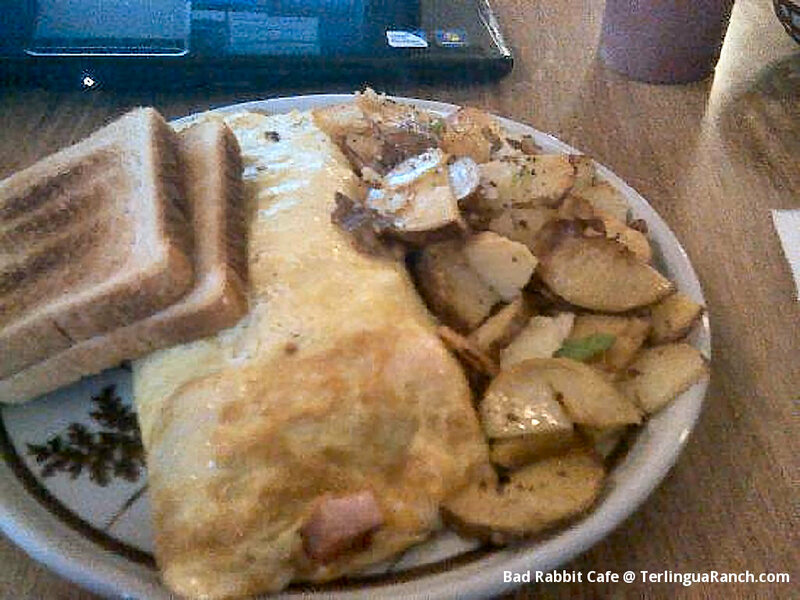 Whether you seek the best of Big Bend restaurants or the top Terlingua restaurant, topping the list for both is the Bad Rabbit Cafe located at the Terlingua Ranch Lodge resort. It started out as a design for a boys’ school crest, but the Terlingua Rabbit was just too wild to stay at home. When artist Bill Neale’s creation joined forces with the likes of Carroll Shelby and friends, and adopted the name Crazy Rabbit, it was the beginning of fast living and fast cars. During a hunting/partying expedition in the early 60’s, the idea of the Terlingua Racing Team was born and so was Crazy Rabbit’s new career. In an early Racing Team press release, Neale explained the meaning of the crest’s elements: “The rabbit thrives in the Big Bend and being fast of foot was picked to dominate the design. He’s holding his right front foot up to say ‘Hold the chili peppers in the chili.’ The sun is there bcause it always is in the Big Bend country. The feathers represent the three Indian tribes: Comanches, Apaches and Kiowa, that lived in the area and were responsible for the Terlingua name. Although the three feathers appear to have been dropped when Crazy Rabbit was incorporated into the Terlingua Ranch logo, the original design still graces the ’67 Shelby Mustangs owned and run by many racing enthusiasts. It is unclear how or why Rabbit’s first name changed from Crazy to Bad – maybe 30 years of being settled at Terlingua Ranch has slowed him down a bit. Or perhaps he’s adjusting to the changing times. 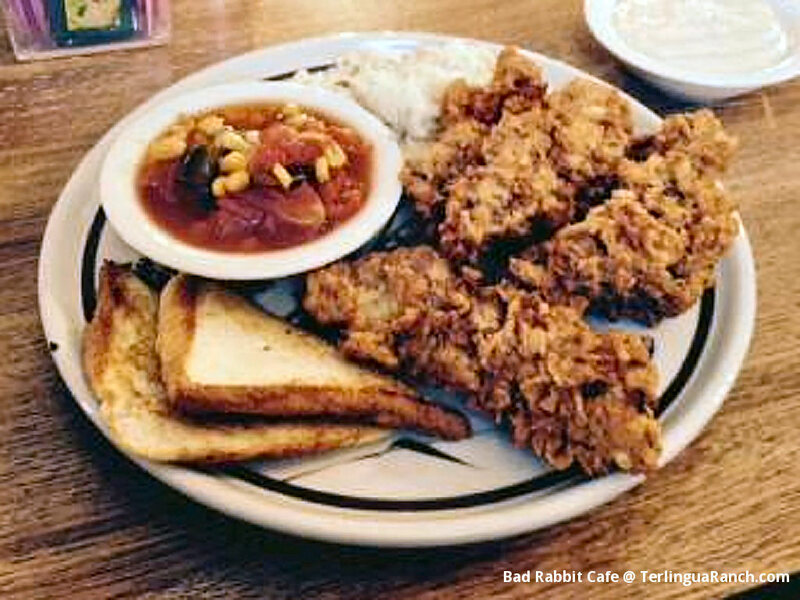 “They have a little on-site cafe called the Bad Rabbit which is a fun place to eat with live entertainment most evenings and a good solid breakfast in the morning.”–Corrie L.
“We had chicken fried steaks, mashed potatoes, fried okra… Inexpensive, good portions and good food. We loved the music! Staff friendly… Mostly locals out for a good time!”–Boot L.
“Hard to imagine that one the best burgers of my life can be found here. Well done, just like I like it, but very juicy with grilled onion and jalapeños. Amazingly good!”–Jay B. “Enjoyed burgers we had yesterday, 1/2 pound bacon cheeseburgers with extra fries to be exact… This isn’t my first time visit to the restaurant and certainly won’t be my last!”–Doug Y.